The new Cadillac ATS, designed from the ground up to fight the BMW 3-series in showrooms, collects a very distinguished trophy as Car of The Year at the Detroit Auto Show. Kicking off the opening of the 2013 Detroit Auto Show, the Cadillac ATS was presented the trophy everyone at the show had hoped their car might earn. Cadillac is starting a new trophy shelf for the ATS sports sedan. 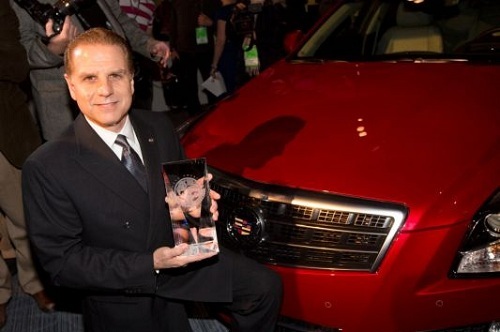 The new Cadillac ATS was honored in November at the Los Angeles International Auto Show by the Motor Press Guild as the 2013 Car of The Year. It has also garnered awards from non-automotive publications such as Esquire Magazine. The al-new Cadillac ATS was introduced one year ago and has since done quite well. Now in full production the ATS is selling at a rate of nearly 3,000 per week. That surpasses other established BMW 3 Series competitors such as the Lexus IS. However, even at that brisk pace, the BMW still outsells the Cadillac 3 to 21 in the US marketplace. Cadillac has no place to go but up in terms of sales. Lexus plans to introduce its own IS, BMW 3 Series competitor in a new design tomorrow at the Detroit show and may be looking over the curtain at the show with more than a little bit of envy. The ATS is a four door model only at this point. There has not been any coupe, convertible, or high performance versions yet leaked to the media, though an ATS-V performance version would be easy for GM to make. Instead of focusing on larger, heavier equals better, as it had in past designs, the Cadillac design team shot for lower weight and achieved their goal. In fact, at about 3,500 pounds, the ATS sells for about $10 per pound. Powered by three engine options, the Cadillac can be outfitted to be very sporty if the 3.6 liter V6 is optioned. However, there is no dual clutch automatic transmission for any version, and the only stick shift is in a 4 cylinder version of the car. Throughout 2013 Cadillac is very likely to begin showing the world newer iterations of this solid platform. Torque News will bring those prototypes, rumors and whispers to you.